WIN A SEAT AT A HAUTE COUTURE SHOW! Franck Sorbier’s fashion shows are always exceptional and magic moments. Haute Couture is a land of imagination. Many will speak of it as legend, as fantasy or even more as mythology. That is perfectly true. However, Haute Couture is a real exclusive instant to experience and share at least once in your life. And, as you cross the “Bridge of Belief”, you can already imagine yourself lifting out of logic and out of reality, moving beyond time and space and beyond time-space, your imagination crosses Frank Sorbier’s imagination land. 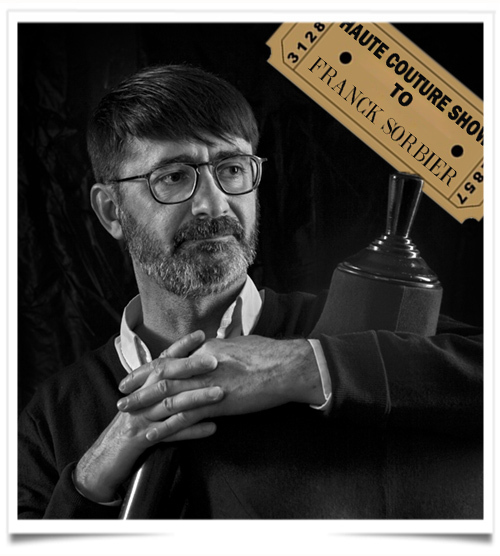 Come and play with Franck sorbier and answer hereafter the four question.We can ensure you that you will spend an unforgettable moment in the Haute Couture world. Which Award Franck Sorbier won at the end of a Haute Couture presentation? Which Academician has been dressed by Franck Sorbier? Where Richard Avedon has photographied several collections presented by Franck Sorbier? Which contemporary artist has produced a work of art from Franck Sorbier’s one couture piece? The person who will have given the first right answer will be selected and invited at the Franck Sorbier fashion catwalk on Wednesday 8th July. Once you have answered the 4 questions, please send your answers to the email: jeu.francksorbier@gmail.com ; Email objet must be : sorbierjeu. This entry was posted in BREAKING MODE, BREAKING NEWS and tagged Franck sorbier jeux by admin. Bookmark the permalink.